Bernd Gruber oversaw the furnishing of a residential house in the middle of Kitzbühel for a business owner. One of a growing number of projects that now bears the unique signature style of this talented interior designer. What makes it so special: no two designs are ever the same. Bernd Gruber’s concepts are always based on the exclusive demands of the respective home-owner. “Why does a living area always have to be on the ground floor?“ A good question, if the view of the mountains is even more impressive from the first floor, thought Bernd Gruber. And did not hesitate to put bedrooms and bathrooms on the ground floor, and design the first floor with an open living room and integrated kitchen. ”When it comes to furnishings, we put an emphasis on modernity. We avoid the old-fashioned and prefer to reintroduce the best of past times“, says Philipp Hoflehner, Creative Director at Bernd Gruber. Mature wooden beams contrast with aluminium window frames, oak blocks mingle with the “Rimini“ lounger by Baxter, and the motorbike belonging to the man of the house is parked behind a freestanding shelf in the living room. Calm and simple – a feel-good atmosphere. Bernd Gruber can look back on an impressive success story. 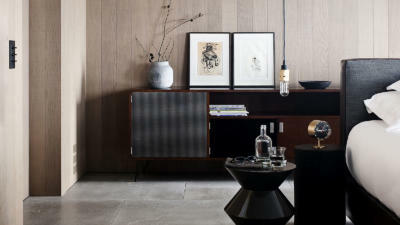 His signature style is the creation of new synergies using an interplay of tradition and innovation. The art of combining the spectacular with the unpretentious is mastered by no other as perfectly and creatively as Bernd Gruber.